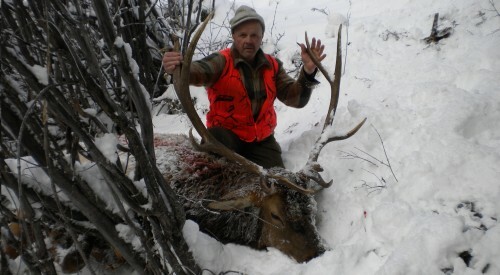 Ric Twardowski is a long-time Montana hunter who filled his elk tag for the 2012 hunting season while hunting in the Bitterroot valley. He was thrilled that he got his bull this year. Darkness fell, so he decided to head back first thing the next morning to pack out the meat. Just as Ric planned, he took off the next morning back to where he shot his elk, and as he approached it, he saw something disheartening–wolf tracks. Unfortunately, the wolves’ taste for elk overpowered Ric’s, and they beat him to the punch. The good thing is that Ric got a nice bull this year–congratulations!–the unfortunate part is that he didn’t get to fill his freezer with his elk. Just something to keep in mind if you end up getting an elk next year–as they say, where there are elk, there are wolves, so be prepared, and plan accordingly.